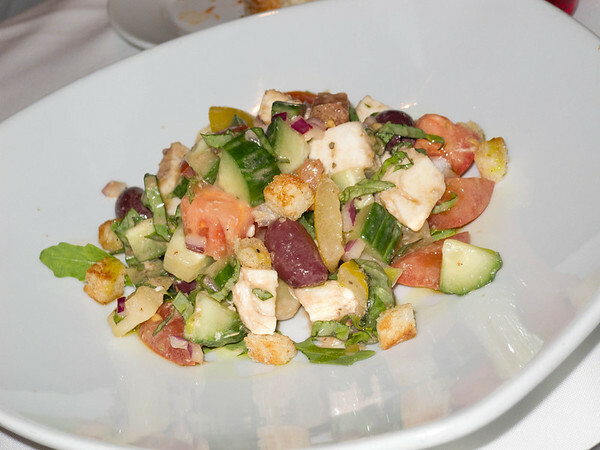 Rating: One of LA’s top Italians! Celestino Drago and his brothers have a bit of a mini Italian culinary empire here in LA with a number of different restaurants and concepts. These include the flagship Drago, a branch in Pasadena, Il Pastiao, Enoteco Drago and Piccolo Paradiso in Beverly Hills, Drago Centro downtown, Panzanella in the valley, a bakery, catering, and probably something I missed. All of these places are top notch and despite the expansion there is a real attention to quality. 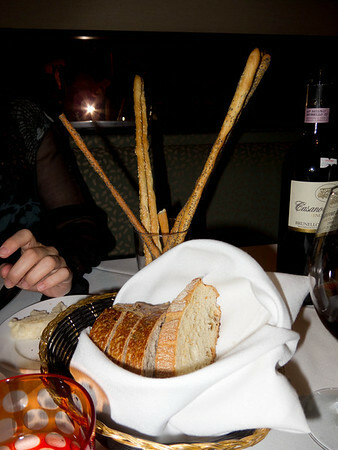 Originally from Sicily the family blends tradition with the modern to make some of LA’s best Italian. Having eaten all over Italy I have to say that the two areas with the best food are in my mind the Piedimonte/Venato and Sicily. And the later wins hands down for desserts. 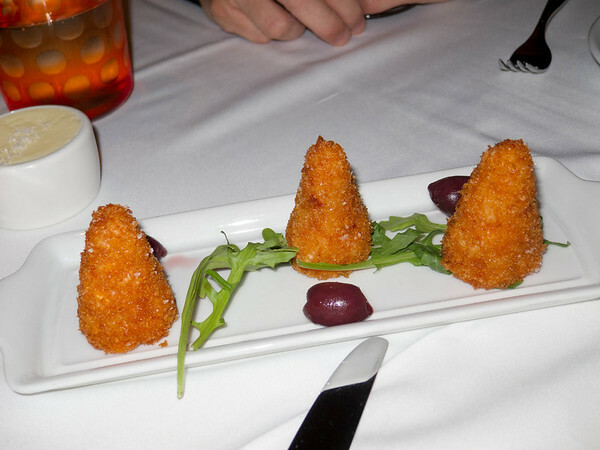 Celistino doesn’t purely stick with Sicilian cuisine anyway, but very much pulls in the latest Italian culinary trends. In particular, the pastas, usually homemade, are phenomenal. He’s also incredibly creative and adaptable. He’s catered about 8 or so of our events and that includes some whacky stuff. In 2006 we even did a party themed after the Ancient World where all of the dishes were based on the ancient Roman cookbook by Apicius. I just gave Celistino a copy with circled dishes and he adapted these VERY OLD (1900 years old!) recipes and brought them to life. Very interesting. Anyway, Drago is the flagship restaurant of the empire, and its most formal. They have a big Menu well represented in every category, including good hearty meaty dishes. Certain favorites persist, but it’s always being adapted and changed (something I like), and includes seasonal stuff. For January, the theme is game! 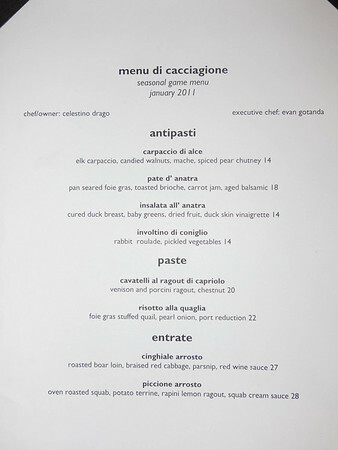 We don’t see it as much here in America, but Italians love meat and game, and no one in LA does it as well as Celistino and crew. Because the group owns its own bakery, they always have really good bread. This is just a small selection, at the bakery or catered events they can go nuts with grain. An amuse. Arincini, which is basically a friend risotto. In this case one with a bit of cheese, tomato, and ground beef. 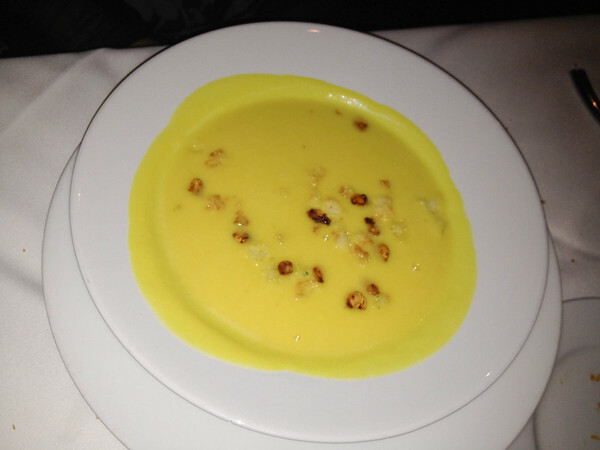 Inside it retains the creamy cheesy quality of the risotto, paired with a hot crunchy outside. Now I prefer my risotto in normal form, but these certainly are tasty. 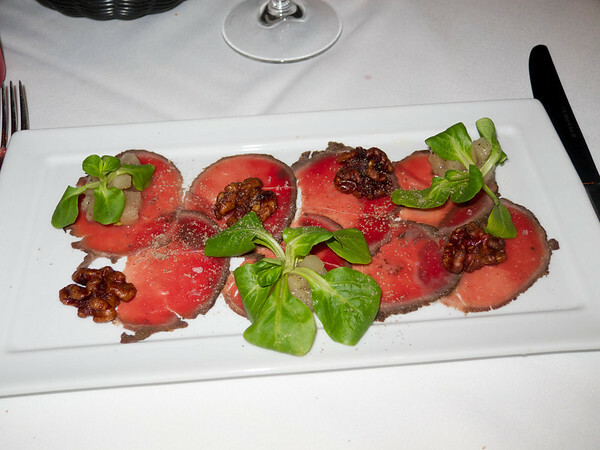 “Elk carpaccio, candied walnuts, mache, spiced pear chutney.” You can see a dusting of fresh pepper. This was a wonderful and different carpaccio. The elk meat had almost a spicy quality to it, certainly more gamey, and the sweetness and crunch of the walnuts paired perfectly. Panzenella. My wife loves this salad. It isn’t on the dinner menu and they made it up for us on the fly, so it actually doesn’t look like it usually does. At lunch the “normal” version can be had, and several of the other Drago Group places have it all the time. Its crunchy bread, tossed with tomatoes, mozzarella, cucumbers, etc. 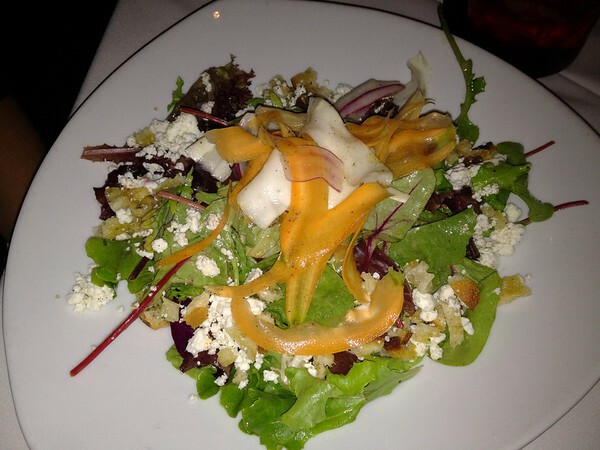 A mixed tri-color salad of greens with goat cheese. 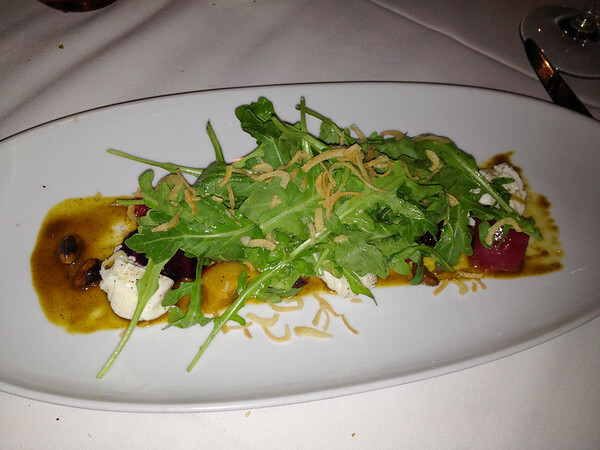 “Burrata, market beets, arugula, pistachio, fried shallot.” Most Italians have a beets and burrata these days, but this way a particularly good one with a very interesting sweet dressing. Another favorite and a Celestino classic. This is pumpkin ravioli in a parmesan cream sauce. Inside is a pure of pumpkin, slightly spiced. A homemade spinach pasta, and then a rich cream and cheese sauce. 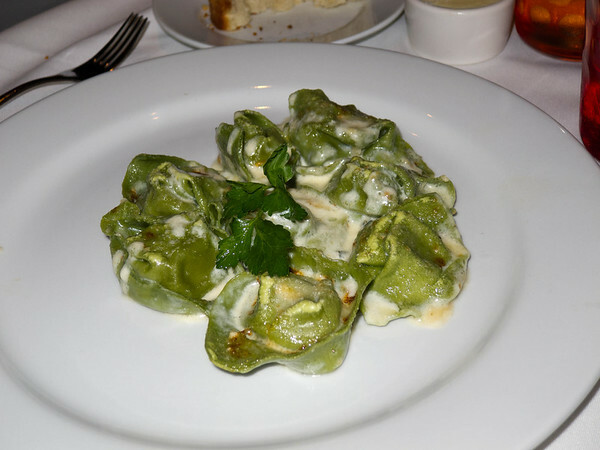 This is a varient on the truly tradition tortellini de zucca where a slightly smaller normal fresh pasta is used, and the stuffing mixes pumpkin and amaretti cookies, and then the sauce is just butter and sage. This version is richer obviously. “PAPPARDELLE AL FAGIANO. 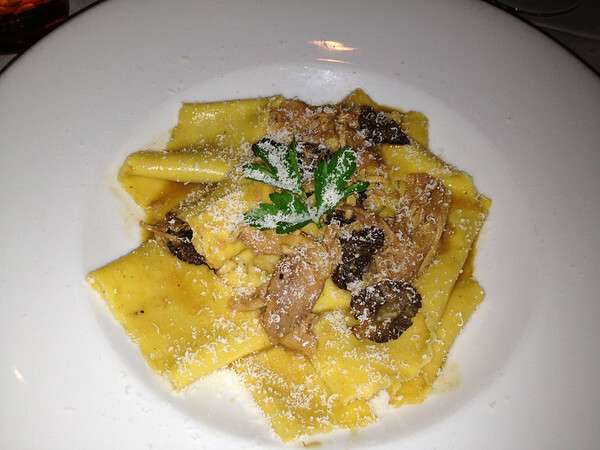 Pappardelle, roasted pheasant, morel mushroom.” This is one of my favorite Drago pastas. A rich winter dish of hearty fresh pappardelle, chunky pheasant, and morel mushrooms. “Cavatelli al ragout di capriolo, venison and porcini ragout, chestnut.” This is one of the reasons I come here: for dishes like this. While this is a special, there are always many great pastas, and this is a level of pasta perfection that you WILL NOT find at 95% of LA’s Italians (although we certainly do have some other great ones: Angelini Osteria, Capo, Georgio Baldi, and many more). 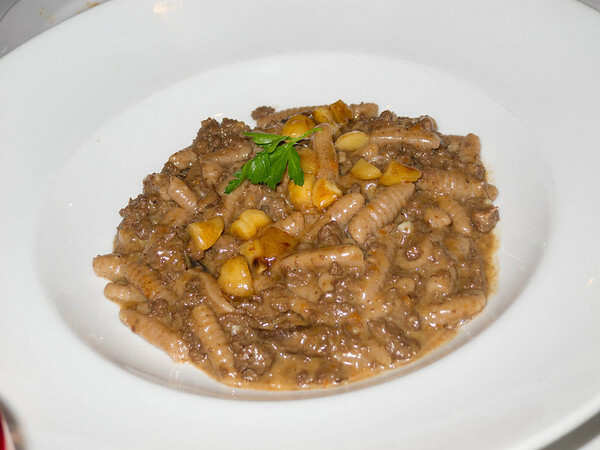 This particular dish is a homemade larvae shaped Cavatelli (pasta perfection) coupled with this incredibly rich winter ragout. The chestnut adds a little crunch and further winter cheer — chestnuts being very popular/traditional in Italy in Dec/Jan. Stylistically I would have to say this is more a Roman or maybe mountains near Rome kind of dish than explicitly Sicilian, but I could be wrong. Doesn’t matter, it’s great. 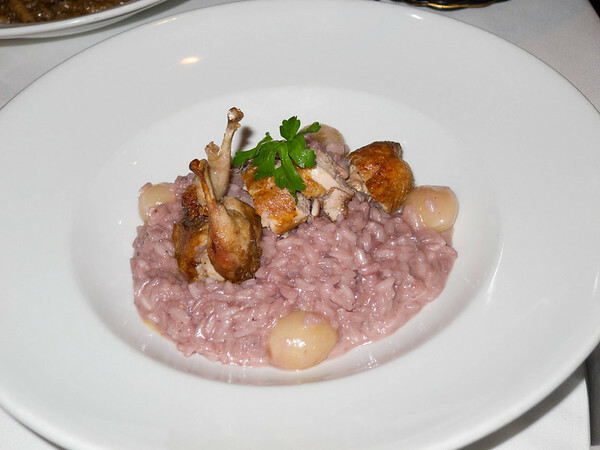 “Risotto alla quaglia, foie gras stuffed quail, pearl onion, port reduction.” Pink Risotto! This was a slightly weird dish. Good, but unusual. The quail was great, perfectly tender and who can fault a little fois gras thrown in? The risotto itself had a kind of tart sweetness too it, and the onions added even a bit more sweetness. It was also perfectly cooked, and overall a very pleasant dish, just not as orgasmic as the cavatelli — and the color is amusing, like the weird pink pizza one of my friends made the other week. In keeping with being Sicilian, Drago always has fantastic desserts. Gelato, chocolate and maple sugar. Really very fine gelato, I’m sure made on premises. It’s hard to find good gelato in LA, but this is. 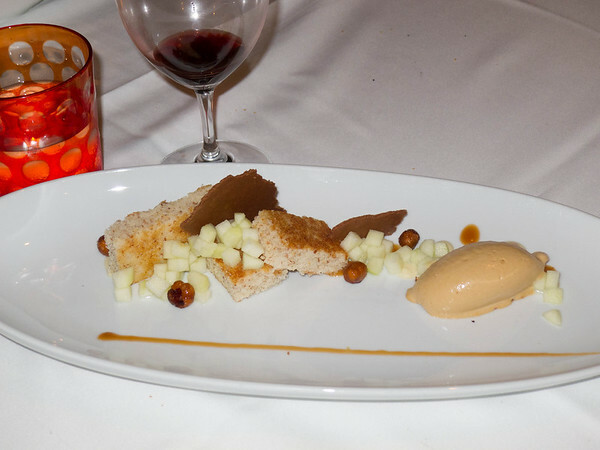 “Dolci di nocciole, hazelnut brown butter cake, praline crunch, salted caramel gelato, apple rum puree.” This is perhaps a deconstructed version of a more traditional Italian dessert, not Sicilian perse as most of those use fresh Ricotta and almonds (yum yum yum!). This was nice, but a tad dry. When all the flavors combined they did so excellently, but I would have loved more gelato as it was SUPERB. Hell, just the gelato and some candied hazelnuts would have been incredible. 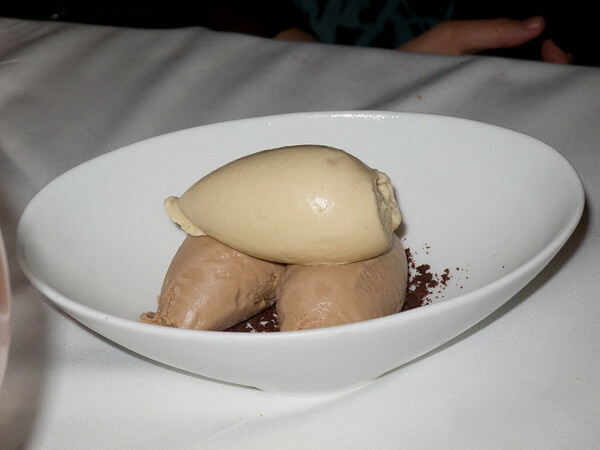 The ice cream itself tasted a bit like the incredible Gjelina butterscotch budino. So while really good, I think this dish could perhaps be better served by a slight format change. Perhaps piling the cake into layer separated or covered by gelato. Or maybe just more gelato would solve it :-). This was just a simple little meal (for Drago) with only the family, so we never even really made it to the excellent meat courses. Rest assured, you can’t go wrong here (or at any of the groups places). Sometimes I’ll come here with a really big party and get tons of stuff, so I’ll have to document that next time I do. 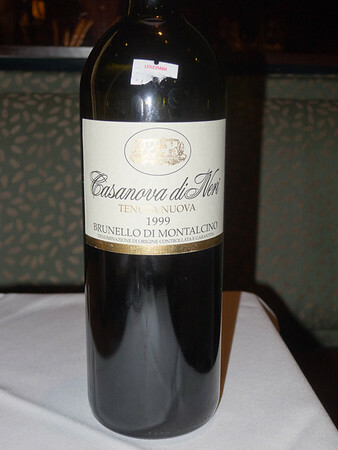 This entry was posted in Food and tagged Brunello di Montalcino, Celestino Drago, Cooking, Dessert, Drago, Food, Home, italian, Italian cuisine, Italian Food, Italy, Los Angeles, Montalcino, Panzanella, pasta, Restaurant, Santa Monica California, Sicilian cuisine, Sicily, side dishes, vegetarian.